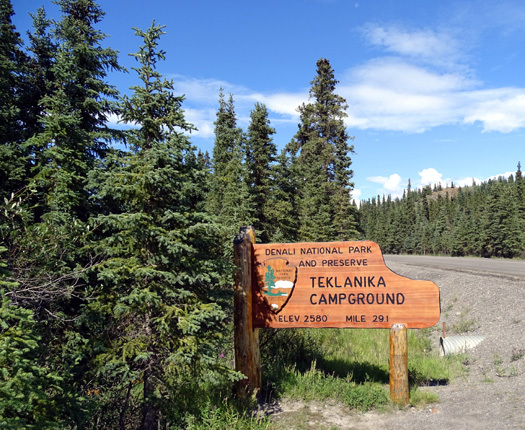 CAMPING AT TEKLANIKA RIVER AKA "TEK"
"Camping in Denali offers a great way to experience this spectacular park. 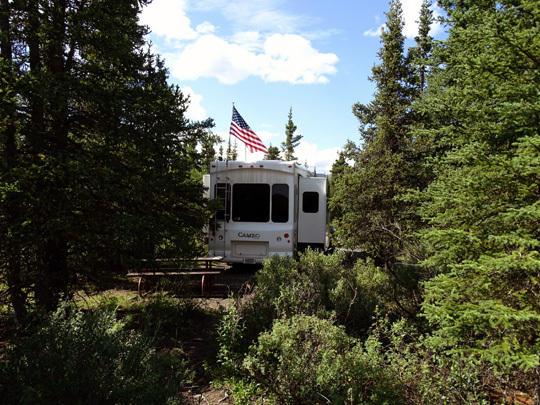 one or more of the park campgrounds should suit your interests." 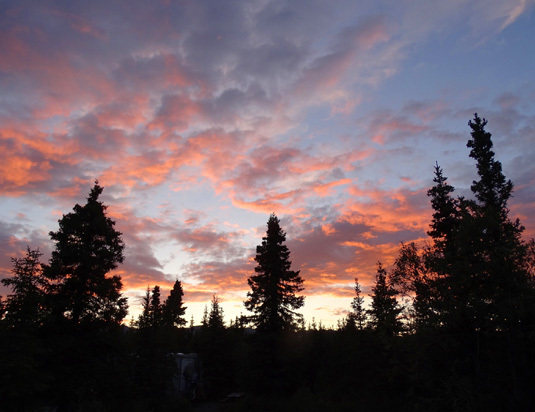 Denali National Park has six different campgrounds plus dispersed backpacking opportunities in the wilderness. 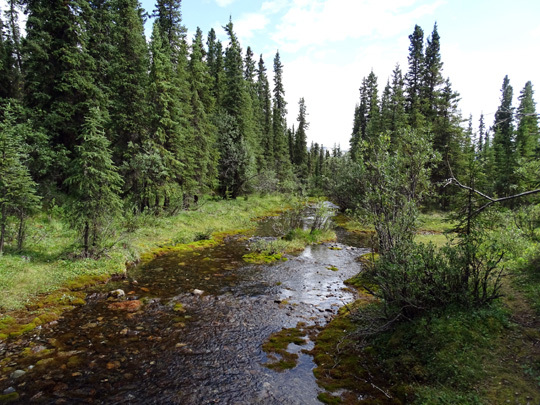 Three of the campgrounds allow both tent and vehicle/RV camping -- Riley Creek near the entrance, Savage River at Mile 13, and Teklanika at Mile 29. Guests with reservations can drive to all of those. Savage River is suitable for smaller rigs. 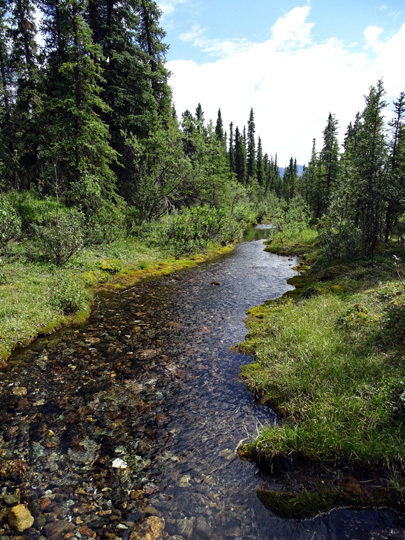 Riley Creek and Tek have some sites that are larger. Sanctuary River, Igloo Creek, and Wonder Lake are tent-only campgrounds that are accessed by shuttle buses. 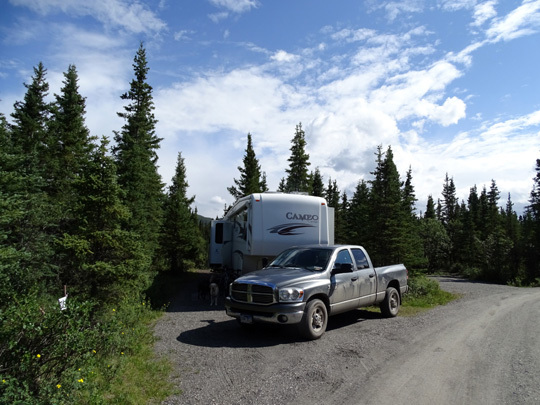 We are using the same MO at Denali's campgrounds that we did three years ago because it worked so well for us then -- several days in the "front country" at Riley Creek CG, four days at Tek in the "back country," then back to Riley Creek for a few days before leaving the area. Campground fees are determined by the amenities offered. Riley Creek's "A" sites are $28/night. More remote Tek costs just $16/night. We paid half price with our NPS senior passes. 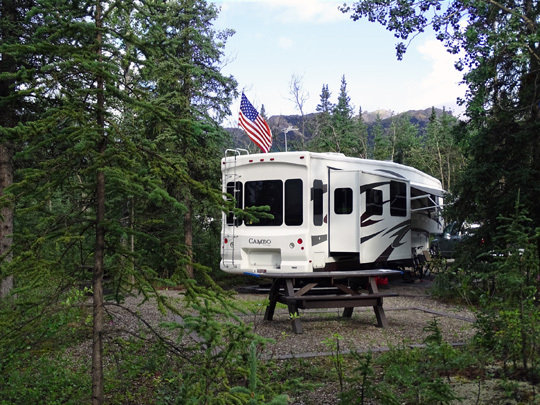 Although none of the park's campgrounds have any electrical, water, or sewer hookups and the generator hours are all rather limited, the three campgrounds that allow RVs do have restrooms and available fresh water. Riley Creek also has a waste (dump) station. 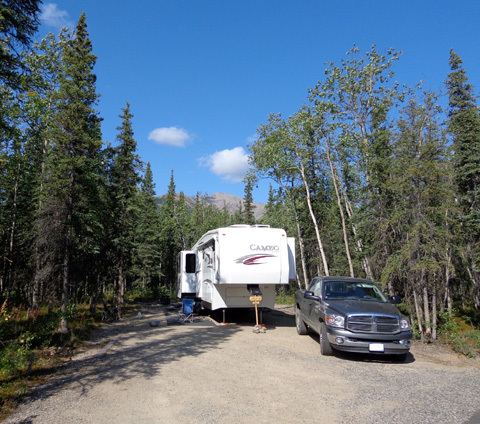 It is the most developed of the park's campgrounds and the most convenient in many ways. It's also the only one where we can get an internet signal. So that's where we spent the most time camping in the park in 2012 and where we'll be the most days this time. 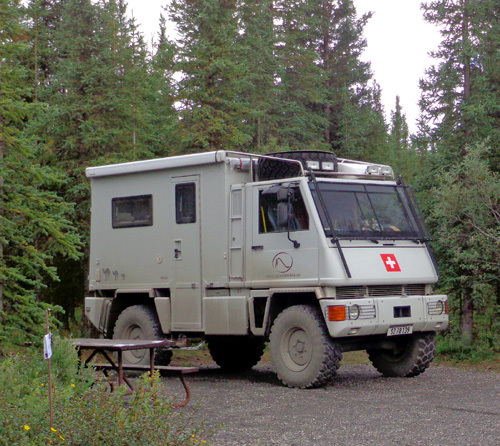 However, there are some good reasons for folks with RVs to stay at Tek for at least the three-night minimum required if you're driving a vehicle out there (you can stay just one or two nights if you go out on a shuttle bus and sleep in a tent). The most important for me is the Tek Pass, which allows folks who stay at Teklanika CG the opportunity to purchase one shuttle bus ticket for any point beyond Tek and then use it at no additional charge every day they're out there. If you're staying at Riley Creek or outside the park you have to pay each time you take a shuttle bus into the back country (beyond 15 miles, the farthest most people can drive their own vehicles). 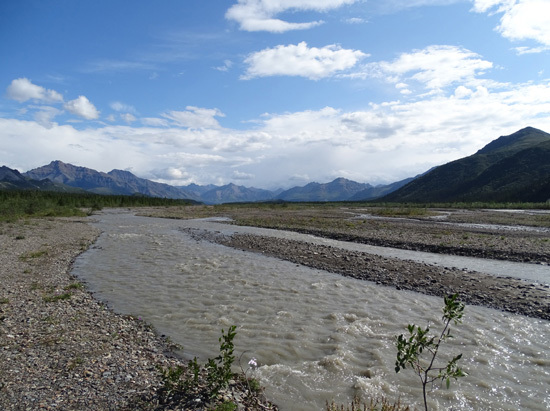 Not only does the Tek Pass allow visitors to get some "free" bus rides, it also eliminates about 28 x 2 miles of the ride = 56 miles on each trip to Eielson at Mile 66, the most popular destination, and beyond to Wonder Lake (Mile 85) or Kantishna Mile 92). Let me be clear. 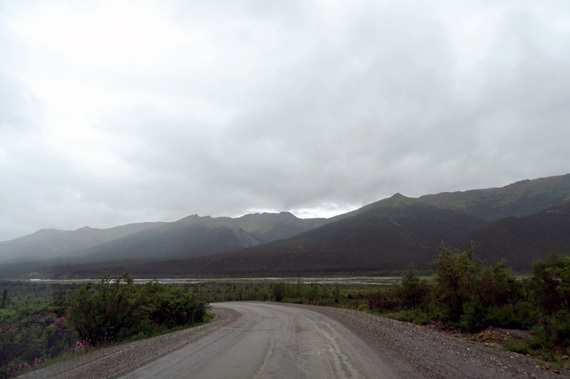 The park road is 92 miles long, mostly dirt, and narrow -- i.e., a slow trip to any destination with all the stops for restroom breaks, wildlife sightings, and views at overlooks. If you start at the entrance and go to the end of the road at Kantishna, it's at least a 12-hour trip on the bus. By starting and ending at Tek at Mile 29 you'll be on the Kantishna bus for 126 loooong miles -- but not nearly as long as you'll be on it to and from the park entrance! Add another 56 miles and probably three more hours for that. The big advantage to staying a few days at Tek for Jim, who doesn't particularly like riding the shuttle buses, is being able to explore farther into the park on his bicycle. He can ride his bike in either direction but has always chosen to go beyond 29 miles so he can see things he can't see in our own vehicle. 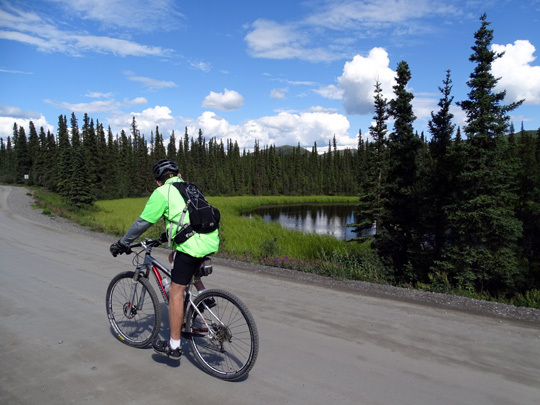 He could also get a Tek Pass and take his bike on one of the camper buses to a farther point like Eielson or Wonder Lake and ride back from there. 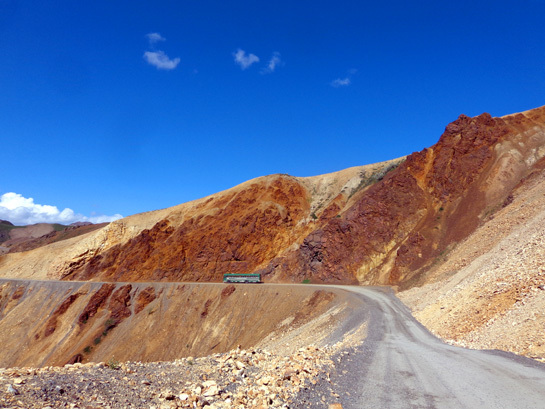 Jim took this photo near Polychrome Pass about Mile 45 while riding his bike 7-22-15. 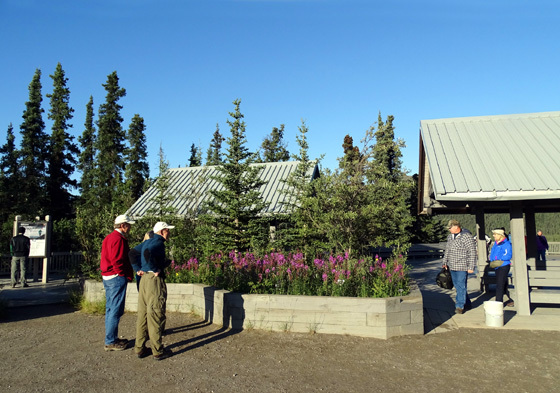 To get past the ranger station at Savage River (Mile 15), you must have proof of campground registration. If you're driving, you have to stay out there a minimum of three nights; we stayed four nights in 2012 and this year so we could have three full days to explore. You cannot drive anywhere else while you're out there, either forward or backward. If you have a motorhome, you cannot take your "toad" to Tek. It has to be parked at the main visitor center. If you ride a shuttle bus back to the entrance, you have to pay for a new ticket to get back to Tek! The Tek Pass doesn't cover that -- just farther out from Tek and back. Despite the isolation at Tek -- no internet, no TV, no stores, etc. -- we love the solitude and beauty of the place. It's a smaller campground than Riley Creek and much less "busy." 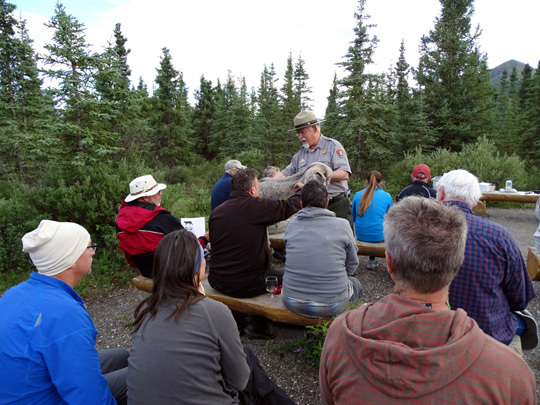 It's a great place to relax, walk around the campground, explore the riverbed, and attend ranger talks in the evening. On Sunday we left our site at Riley Creek at 8 AM and went to the nearby dump station to dump waste water and get more fresh water. Water is available out at Tek but sites don't have hookups. We learned three years ago that to have the best selection of campsites at either Riley Creek or Tek, you have to get there before noon. 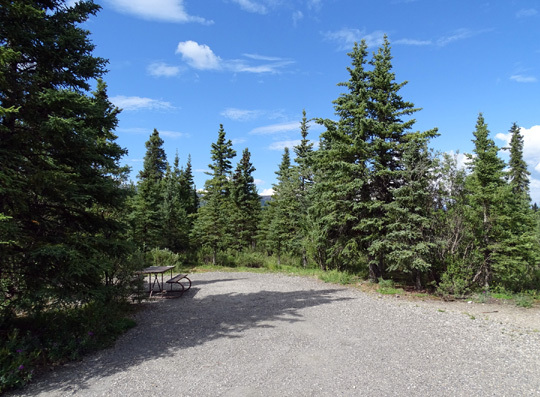 Although you can reserve a space, you can't reserve a specific site at either campground. Note: These campgrounds fill up every night in the peak summer months. It's rare you can show up and get a site the day you want it. Both years we've made our reservations online the very first day possible -- December 1 of the preceding year. 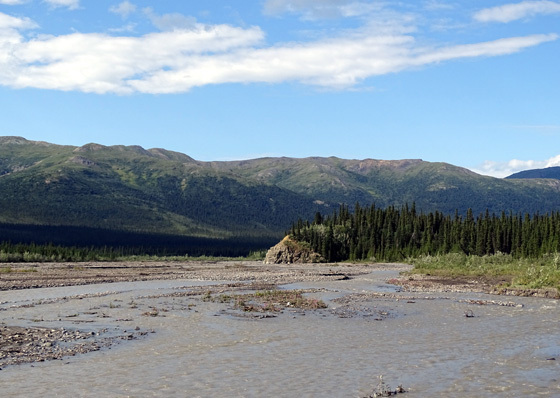 If you plan to camp at Denali in 2016 consider making your reservations as soon as allowed because it's the National Park Service's 100th anniversary and they are promoting themselves heavily. We didn't see much of anything, including animals, on the way out to Tek because of the rain and low clouds that morning. When we got to Tek we circled the two loops to see what sites were available. Our first choice of available sites was a relatively large one in the first loop that was easy to back into. It's long enough to park the truck perpendicularly in front of the camper and there is enough room on the sides for our slides and awning. We have good privacy and a convenient place to walk the dogs to potty. The campground looked full all four nights we were there, mostly with small rigs and tents. If we'd gotten there later in the day, we wouldn't have found a site large enough for the Cameo. Although we spent most of the three full days at Tek out on the park road -- cycling, walking, riding shuttle buses farther into the park -- we also spent some time relaxing in the campground and surrounding area. 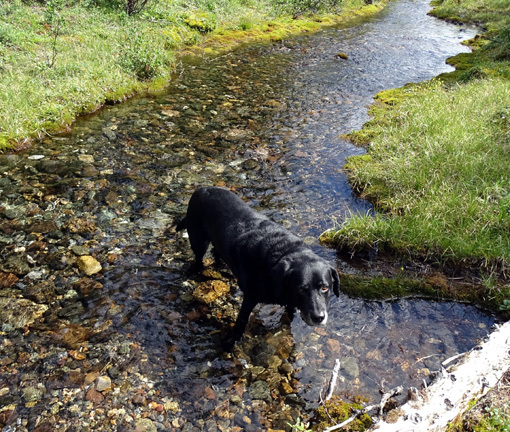 Dogs are allowed at Riley Creek and Teklanika campgrounds. 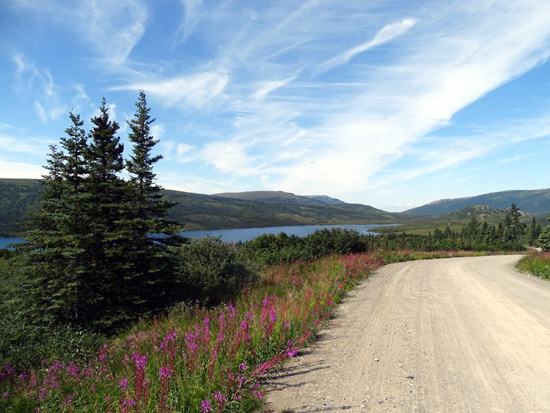 However, they have to stay on campground roads, the park road, or the paved bike path in the front country. They aren't allowed on trails or in the wilderness. That's not too terrible because in and near each of these campgrounds I was able to walk Cody a couple miles each day and Jim had several miles where he could ride his bike with Casey. Each day at Tek Jim rode with Casey on the Walky Dog through the campground and out on the park road to the Teklanika River overlook and rest area where the shuttle buses stop about a mile and a half past the campground. Casey loved the exercise and the attention she got from passengers on the buses! Most of them had to leave their furry companions at home while on vacation half a world (or country) away so they were happy to have a wiggly pup to pet. All the shuttle buses stop at the Teklanika River overlook outbound and inbound on the park road. 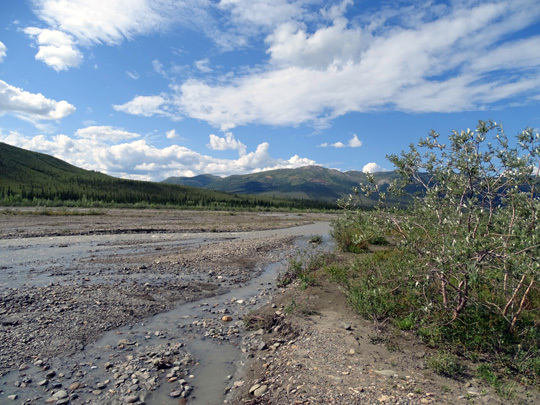 One time when Jim was on the large deck overlooking the river he saw a grizzly bear ambling along the wide gravel riverbed -- in the same place I hiked three years ago. 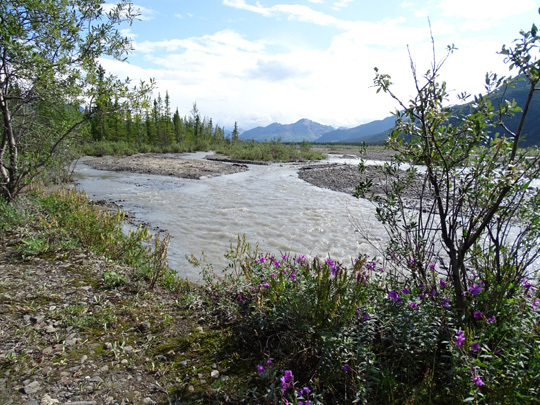 One evening I took a solo hike along the Teklanika riverbed behind the campground. 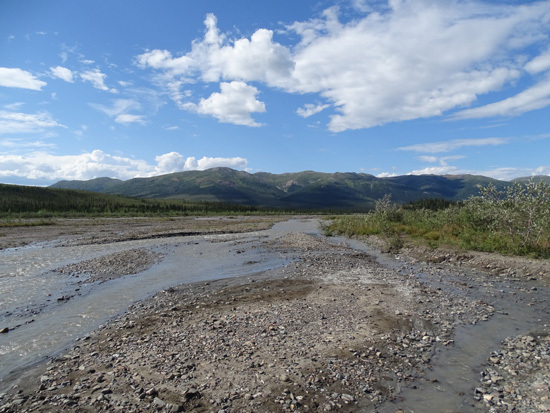 I waded through several shallow streams in the wide, braided gravel bed before reaching the main channel of water. There wasn't much point in wading through that so I just walked along the river for a mile before turning back. Because of all the wildlife -- including grizzly bears -- that use the river for hydration and a travel corridor, I carried bear spray. We attended an interesting ranger talk on our last evening at Tek. We really enjoyed those talks at both Riley Creek and Tek three years ago. This one was about lynx, which are low in number this year because the snowshoe hare population, their main source of food, is also low this year. The hares have a 10-12 year cycle from low to high populations, and the lynx mirror it. 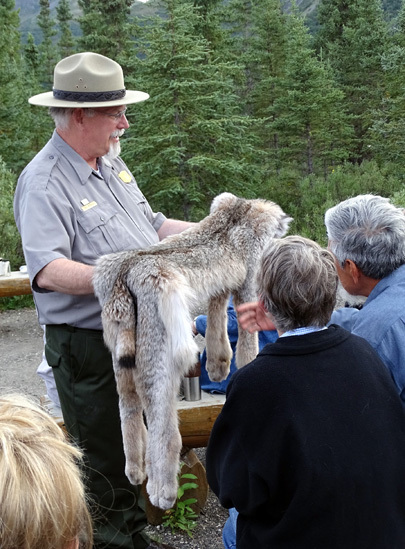 There are lynx in and near our campground but we haven't seen one this year. Jim did see one in the Savage River bed three years ago. I'd love to see one. Except for a surly couple serving as campground hosts this summer (no hosts out there in 2012), we enjoyed our four nights at Teklanika Campground and highly recommend it to other visitors. And be sure to get Tek Passes for everyone in your party so you can explore more of the backcountry beyond 29 miles at a very reasonable cost.